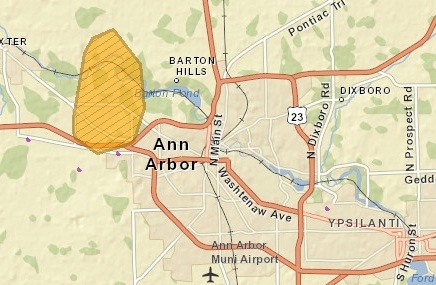 Posted on Tue, Feb 21, 2012 : 9:25 a.m.
Power was restored at 9:40 a.m. Tuesday for about 1,600 DTE Energy customers northwest of Ann Arbor after an outage of about two hours, the utility said. Equipment failure caused the power to go out at 7:49 a.m. said DTE spokesman Scott Simons. Weather was not believed to be a factor, he said. The utility’s power outage map showed service out in an area stretching from east of North Wagner Road to Zeeb Road. The area of the power outage is shown in brown. If only those new smart meters were installed, as mentioned in yesterday's news, then the power would have been restored in 1 hour and 45 minutes instead of 2 hours. Tue, Feb 21, 2012 : 4:03 p.m.
Tue, Feb 21, 2012 : 3:33 p.m. Thank You for volunteering to &quot;Save the Planet&quot; by giving up electricity for a few hours! Tue, Feb 21, 2012 : 2:59 p.m.
Power came back on here at 9:40. Hooray! I have dough for 60 baguettes and need to start baking at 11 am. Tue, Feb 21, 2012 : 4:36 p.m.
no, today is packzi day, not baguette day. fail. Tue, Feb 21, 2012 : 2:50 p.m. I like DTE's map utility. If they could tie that to a restoration estimate, that would be useful. Tue, Feb 21, 2012 : 2:49 p.m.
Tue, Feb 21, 2012 : 3:08 p.m.